Let me begin with identifying what the term ‘White Girl‘ means for those who are unfamiliar with internet slang. A creature who often posts pictures of Starbucks on Instagram, Tumblr, or Facebook. Often wears leggings and Ugg Boots and posts about how Nutella is very good when everybody knows it is. You will always see a White Girl with her Ugg Boots on, Leggings on, and IPhone at Starbucks. The second part of my not-so-very-exciting adventure was trying bubble tea for the first time on the same day (I’ve really outdone myself, I’m also currently listening to Taylor Swift’s Fearless album whilst writing this to make matters worse) which was a much more exciting experience as I had never tried anything like it. 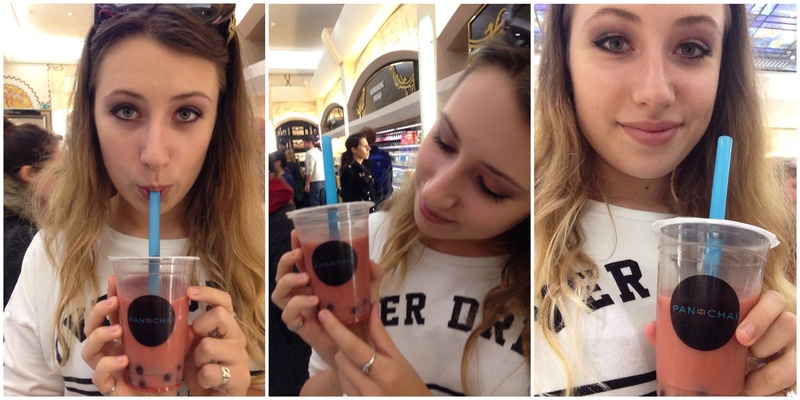 Whilst wandering through Harrods I decided to buy some watermelon flavoured bubble tea from pan chai, it was both amazing and confusing. I would say overall it really depends on the flavour and I found that the one I tried got a bit too sweet for me after a while. I was convinced that the little balls/bubbles were some weird type of jelly but was pleasantly surprised to find out that they are actually chewy tapioca balls that are extracted from cassava root. As you can see in the picture above, I’m shamelessly taking pictures of myself with the bubble tea because if it’s not on instagram, it didn’t happen, right?